Yes, you, too, can appear rather humdrum about the day when using this adorable tote. You know where your keys, cell phone, wallet and sunglasses are. You know your tote is stylish, yet not yet another fad of the minute. You are confident in your smile, your bag and yourself. 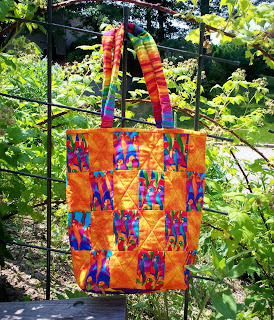 Outside of tote is made up of 100% cotton, machine pieced and machine quilted, lining is chocolate brown cotton. Polyester batting is sandwiched between the 2 layers. The handles are cotton webbing with grosgrain ribbon sewn on top. 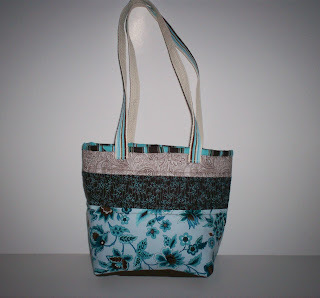 Bag measures 7 inches (18 cm) wide, 8 inches (20.5 cm) high and 4 inches (10 cm) deep. Handles are 3/4 inch (10 cm) wide and have a 10 inch (25.5 cm) drop. Shipping rate is for first class mail. Feel free to contact me if you would like to purchase shipping insurance or have this bag sent priority mail. What a summer! Aside from the fact that it rained all of June and most of July...I had my foot surgery and it went well. However, the pain meds screwed up my sleep schedule and even with satellite, there really isn't too much on in the wee hours of the morning. I realized the cheezy movie "Staying Alive" has actually gotten cheezier in the decades since it's original release. My children really stepped up and took care of themselves and me. They made me breakfast every morning and brought it to me on the couch. However, they'd pour my cereal, pour on the milk and then pour their own and eat it. Cheerios are pretty gross after sitting in milk for about 20 minutes. They had a great summer of swimming lessons....Sarah can swim now. Not super far, but..and she's lost her 2 front teeth. She loved tennis and had a blast sailing. Griffin is right behind her in the swimming department, he loved tennis, but didn't sail. I had a major klutz moment, walked into the blade of the pole saw (the nasty looking arched blade on the end of a long pole that you use to cut tree branches while standing on the ground) and ripped a hole in the side of my face. Four sutures later, it did heal pretty well, not a very bad scar..but, I did go straight from the ER in Manchester to the lake and went sailing for 2 hours with my friend who was visiting from L.A. There are priorities in life, after all. I didn't get much sailing done, but Michael had a good season. Other things I learned...I play croquet AND Trivial Pursuit much better when moderate amounts of alcohol are consumed, by me. Who knew????? Once I get all unpacked and find my card reader, I'll post pictures. I learned a lot more about my big toe today than I ever knew before. I don't know about you, but I really don't pay a lot of attention to my toes. In fact, I have quite unattractive feet, especially my big toes. Actually, they are ugly. They are just those things at the end of my feet to help me walk. About a year and half ago, I dropped a large piece of firewood on the end of my big toe, turned the nail black, and the big joint was sore. It all healed and I thought that was the end of it. Then, this winter, my son ran by me, I was sitting down with my feet up-something I rarely do-caught my big toe and yanked it to the side and it's hurt ever since. Some days I can't even bend it enough to get it in a shoe. Last Sunday, I decided my rock garden HAD to leave. I was wearing sneakers, not my steel toed boots (I have explained to my husband numerous times that I didn't plan on ripping out the rock garden in sneakers, it just happened, but he doesn't understand such things) and while standing on top of the retaining wall, dropped a very large, 30 pound flat rock on my joint. It made the whole thing feel better. So, the main point of this blog post (finally) I have the start of a bunion. That in itself does not sit well. Aren't bunions something old ladies get? I'm not ready to do the weekly perm and blue dye job yet..but dropping something on the END of my toe and having my toe wrenched to the side did more damage then dropping a rock right on the joint. Extreme force at the end of the bone causes more torque on the joint, thus causing more damage, then extreme force right on top of the joint. The moral of my story? Sitting down with your feet up can cause severe damage to your big toe joints, so I guess I won't be doing that again anytime soon. And, if you are going to drop something on your toe, don't do the "toe scrinch", you know, scrinching your toes up so they aren't sticking out as far? Just relax and let the large, heavy object land right on the top of your feet and toes. So, I'm back trying to blog, I've been really working hard on decluttering my house. The last room I have to tackle is the sewing room. Let's just say I got burned out at Christmas sewing for family and friends...besides etsy....and I literally piled my bags of fleece right inside the sewing room door.......there is lots of sorting and organizing to be done, but I'm getting ready and have some new ideas to work on. I'm also studying for my state licences for life insurance and securities. Yeah, I know. Like I needed to start a new business venture with all my spare time. My seeds are sprouting, if it stops raining for 2 days in a row, the peas and lettuce are going in. The vegetable bed is thawed, and the first batch of compost has been added and worked in. Just waiting to have the time to assemble the pea fences and put them up...and for the ground to be dry enough to support them. 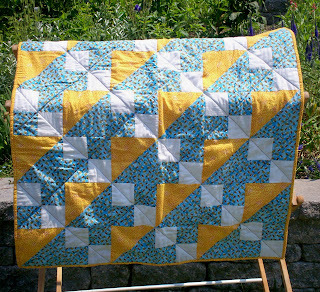 So, in honor of spring, and nature..and all of us frantically getting out to enjoy the warm weather and gardens....please enjoy my Busy Bees quilt. Yeah, I know. It's been a while...in fact, a VEEEEEEEEEEEEERRRRRRRRRRRYYYYYY long time since I've updated my blog. I've been busy. Since my last post, my garage has been de-cluttered and on Valentine's Day, my car went in (it's been about 4 years since that last happened) Slowly and methodically, the entire house is losing the crap. Guess what? It's much easier to keep it not only neat and tidy, but actually CLEAN when there isn't stuff everywhere. I've finally discovered I don't need more storage, I just need less stuff. It's been great to donate so many of my treasures that I don't have a use for. I know someone else is getting some enjoyment from them and I'm helping someone else less fortunate in the process. A win-win all around. Today I was able to go celebrate the life of a wonderful woman, Viola Fleming. When I heard of her passing, I knew I would be attending the funeral service no matter what, it wasn't a question, it was a definite. I met this woman named Cathey when I worked for an equine surgeon. She was close to my mother's age, but had such a sense of humor and such a warm personality, we quickly went from just coworkers to very close friends. I rode one of her horses. Bear (actually, Cathey's son, Aaron's horse) and must admit to some pretty crazy riding adventures in the woods of Pembroke. I attended family events and parties and got know Cathey's family. Meme, as Viola was called by her grandchildren, had a wonderful sense of humor, a great smile, but had no problems telling anyone if they weren't exercising the best judgement. I was not immune from this...and you know what? She was right. I was about to do something stupid. Cathey's sister, Susie quickly became a friend, also, along with Susie's daughter, Missy. I left the vet clinic but still rode Bear. Then, Bear injured her leg and I stopped riding her. I was no longer at Cathey's house every day, and eventually moved to Manchester. However, I kept in touch with Missy via email, attended Missy's baby shower and her son's christening. I would see everyone every few years and we'd pick up right where we left off. We didn't see each other much anymore, it happens to everyone, life gets in the way, but we still had that connection. Today, I really felt the connection. I walked into the church, late, per usual, and went right up to the front and sat behind Missy and the rest of the family and didn't think twice about it. I was doing okay until I saw Susie teary, I started to cry then and when I hugged Cathey, well, I did wonder why I wasted my time putting on makeup this morning. It was a wonderful service...but the best credit to Viola is her family. They all know what's really important. I haven't seen any of them in over a year, yet I was immediately included in the family. There were some family members I didn't remember or hadn't met, but it didn't matter. Today, I was a Fleming. Maybe not by blood, but in the heart, where it really matters. So, Meme, Rest in Peace. Your memory will always be alive and your kind and generous heart rests in your children and grandchildren. I feel blessed to be a part of it.